Our Paint Rave Washable Fluorescent Neon Party Paint will turn any party into a BLAST! Nothing beats great music, black lights with strobes, and everyone being covered head to toe in various Neon Glow Colors. There are many types of Parties and Themes and We can Help guide you to the best solution for all of them. 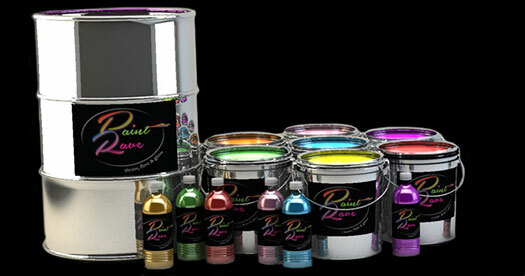 Our paint will turn any ordinary party into a RAVE!!! PAINT GUNS & MOREWe sell the 3ft water cannon type guns in case packs of 4 units. These are excellent for Large Parties to draw paint from the 5 gallon pails and shoot a large quantity of paint at one BLAST! COMPLETE INFORMATION FOR PAINT PARTY SET UP AND CLEAN UPIf this is your first time, here is a step by step including a list of do's and don'ts and how to handle the paint and some clean up tips.